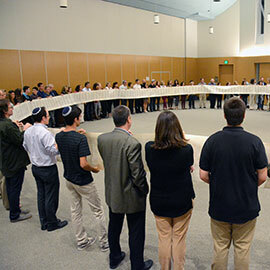 At Leo Baeck Temple we seek to celebrate the joy, beauty, depth, and mystery of life through communal prayer. Our synagogue is a welcoming home for spiritual exploration. Shabbat and festival worship at LBT is joyful and interactive, contemplative and soulful. Our main services are filled with music, sung mainly in Hebrew with full transliteration so that all can join in. We use an original siddur (prayerbook) created by our clergy. Congregants participate in all of our services as active worshippers, Torah readers and prayer leaders, contributing to the sense of community that worshipping together can encourage. Every service is open to the congregation and to the general community. Non-members are most welcome at Shabbat and festival services. We hope that by offering a variety of ways to worship, everyone who wants to will be able to find a meaningful spiritual pathway, bringing each person closer to the community and closer to God. To learn more about LBT’s newly introduced 25 Hours of Shabbat – a Temple-wide initiative to help all members of our community experience Shabbat in a transformative way – go to this page.